Steve - you are correct in that the 'big switch on' was 16th December and it was covered extensively by the Adver. Interestingly all the comments at the time were 'positive' and very gung ho. Indeed according to Mr Hunt DC would be selling other linked servcies to Highworth residents by the end of next month - January 2010 that is. According to Mr Hunt - Highworth was 'almost completed' and he is saying the same today nearly one year on. Yes Des you are correct thank you, it was the 16th! Tt was originally to have been somewhere on or around the 5th Dec, but I think there was a delay due to the snow? As I understand the rest of the money less 50K was paid before the end of the 2009/10 financial year on 7th May, if you recall to enable that to happen that is why a special cabinet meeting was held on 31st March. December 15th to March 31st is not a 6 month period and I believe was part of the proposed timeframe as outlined in the report to cabinet. If there is a delay or I have any of the facts wrong in my post. I am the council will email me with the facts, so that I can post on TS any correction. So the money was paid in May but what work has been done? None I call on cllr perkins to stop procrastinating and deliver what is stated on the clip to by his leader on 16th November 2009. This webcast from the Civic on 16-11-2009 it is made clear at the close of the clip that the scheme will start on 7th April with a full rollout to other area by April 2010. Trailblazing Swindon Borough Council is working with the private sector to make Swindon the first town in the UK to provide free internet access for all its residents. The Council has teamed up with the concept’s originator Rikki Hunt and digital technology firm aQovia to create the company Digital City UK, which under the brand name ‘Signal’, will install a Wi-Fi wireless mesh covering the whole of the Borough of Swindon. The exciting technological revolution is Swindon Borough Council’s first public/private commercial venture and will provide a range of services and applications for the whole community including free connection to the internet, free line rental and connection charge, and borough-wide movement, while staying online. The public will be able to access the internet and download emails for free but usage will be limited. Subscribers will also be able to sign up for 20Mb upgrades for significantly less per month than major broadband competitors following a free three-month trial, while there will be pay-as-you-go options so visitors to the town can benefit from the Wi-Fi network. The technology will also revolutionise home and business security courtesy of CCTV coverage with rapid response, allowing homes and businesses to be monitored via a control room or remotely using laptops. Anti virus software and Microsoft and Google online services will be a key feature of the network and there are plans to deliver valuable real-time information on home electricity usage and street-wide air quality monitoring. Swindon’s Wi-Fi also has the scope to deliver free voice calls and could be used by health professionals to carry out consultations and remote medical procedures or examinations through Telemedicine. The Wi-Fi project will be run by Digital City UK Ltd, of which Swindon Borough Council has a 35 per cent share, with the intention of working on similar roll-outs of the technology in other towns and cities across the UK. The first phase of Swindon’s Wi-Fi network will be switched on in Highworth in early December with the remainder of the project being completed by the end of April. Mustafa Arif, director of aQovia, said: “Ubiquitous wireless internet is essential to the realisation of a ‘Digital Britain’. Sadly the city Wi-Fi hype died out a few years ago with scant examples of any sustainable networks. Why was that Mustafa, Cllr Perkins? Pop around to your corner shop, if you still have one, and get this weeks copy of Private Eye. The ever popular "Rotton Boroughs" section features Swindon's WiFi and as a bonus, another Cotswold Water Park / Watermark story. 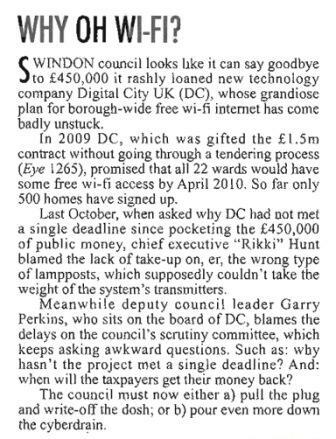 Why Has Swindon WiFi Made it Into Private EYE Rotton Boroughs Twice? Was it so good they named it twice? The recommendation from officers (one assumes as GJ is the lead in this issue he agrees with the recommendation) is that the job of negotiating with the 'potential investor' should be left to The Leader, the Cabinet Member for Finance and the Chief Executive As they were responsible for the negotiations which saw us embroiled with Rikki Hunt, which failed to spot the weak points in the business plan and simply ignored any proper examination of the deal, one would imagine they should be the last people on the planet to be entrusted with any negotiations for the future of Wi-Fi in Swindon. They start from a position of weakness - in that they need to recover the Â£400k plus. They are wedded to the idea that a Wi-Fi system is reuqired. They have failed to accept any sort of responsibility for the position the project is in at present and each had a determining voice in sanctioning the second tranche of the loan - they should have known better than throw good money after bad. wireless data infrastructure for Swindon. In other words we can do anything we like without having to answer or account for anything. They are getting dangerously near the edge aren't they? I wonder how long it will be before someone 'sits' on them because they have become an embarassment? I thought, according to Cllr/Director Perkins last month, that: "The cheque is as good as being in the post"
If there's a genuine 'investor', and given that the Bluhnderbirds usually dole out generous sweeteners, (a Â£14,000,000 car park to kick-start the Union Square development anyone? ), what's the betting that our investor offers a sum far below the Â£400,000+ Digital City owes Swindon taxpayers and the Bluhnderbirds will still manage to give away something expensive on top of it? 'I'll give you Â£25,000 for the equipment, and Â£250,000 for unlimited and exclusive rights to use every lamp post in the Borough for whatever I want, including the Â£1,200,000 pounds worth of new lamp posts you're putting in over the next couple of years....."
Ah, so they've massaged the minutes again. Can't stop 'emselves can they? Tell one little lie and the next one has to be a little larger. Repeat ad nauseum and Voila!, you have a fully dysfunctional Bluhnderbird Council in which the administration puts more effort into hiding, obfuscating, shuffling and lying than it does into being a working council. The document that Geoff has obtained seems to be seeking a confidentiality agreement that will last 60 days, starting I presume on the day that the document is dated, March 9th 2011. Now that means it will be valid right up to and including the local elections which are on May 5th 2011. I make that 57 days after the start date. Is this a coincidence, or is someone seeking to shut everyone up during the upcoming "Election Fever"? If someone knocks on your door seeking your vote, what will you want to talk about? Now that means it will be valid right up to and including the local elections which are on May 5th 2011. The timing of this seems pretty awful.. so I'll raise that as well. Does this administration actually have any residual respect left for their electorate when they treat them with such disdain? Remember folks he who laughs last laughs longest and what goes around comes around. Residual implies there was any to start with. They've been playing survival politics for months. Can anyone, seriously, explain to me what place confidentiality has in local government? Think about it, it is intrinsically wrong. How on earth did we get to the situation where public servants think it hunky dory to conceal things from the, erm, public. I've no doubt some apologist will say that if they didn't they would get shafted when the went to procure goods and services, I take the entirely opposite view. First off, stop procuring goods and services you have no business procuring, thus no requirement for secrecy. Openly procure the goods and services that you do not supply yourself, that way said suppliers can't do any grubby little deals by bedazzling, befuddling and generally bamboozling our local authorities Happy Shoppers. That way if some scrote asks for, I dunno, half a mill to invent and supply something that has already been invented and supplied a responsible adult can say 'I don't fecking think so'. Mebbe one supplier is knocking out binwagons at Â£20k to the private sector and Â£25k to our Happy Shoppers. Again, 'I don't fecking think so' and so one, for cleaning services, stationery supply, building maintenance etbloodycetera and so bloodyon. Hide nothing and nobody has a need or anywhere to hide. If all local authorities ganged up and adopted this method imagine the purchasing grunt they'd have. a high speed wireless network for Swindon. What does Exculisivity actually mean? which in this case is 22 September 2010. Limited on commercial terms and secured by a shareholding in the company. I am really confused here as if it is to set up a high speed wireless data infrastructure, why is the council involving itself as a public sector organisation in a private company? Or is the council putting out a tender/expression of interest exclusively? What Did The Leader of The Labour opposition know when on 22nd February his letter stated? I understand that the CEO of Digital city informed the committee that it was his intent to ‘gift’ his shareholding in the company to the council. This would result in the council becoming a majority shareholder of Digital City and would mean a private sector company being effectively nationalised by Swindon Borough Council. This deeply concerns me as it is not the role of the council to be a key player in a private market, which the Wifi market most certainly is. THE events and revelations at the recent Scrutiny Committee meeting were marked by a number of important statements. The first was the failure of Digital City UK to have achieved its sales revenue targets and network coverage as set out in the business plan agreed between the company and the council. These targets were considered by officers and cabinet members to be realistic and achievable, it is a matter of concern that they have proven to be unattainable by such a wide margin. It was also clear from comments made by the Digital City CEO at the meeting that there are insufficient funds available to Digital City UK Ltd to meet even its most basic payment of interest on the loan of Â£400k provided by the council. This situation is a matter of regret especially as the relationship was supposedly formed on the basis of a mutually beneficial commercial loan. Mr Hunt made it quite clear that the value of such a relationship was considerably offset by the real world he occupies when he suggests that not paying the debt he owed to the council was ‘just business’. • Mounting transmitters on Swindon’s lampposts and other publicly owned structures. • Making an unmetered connection to the council’s electricity supply. • Connect up to Swindon Borough Council’s internet connection. If all these actions are undertaken by a newly-invested Digital City Ltd without that company paying the market rate, Swindon council taxpayers money would be at risk as the council would be vulnerable to legal challenge under State Aid guidelines. What did Cllr Montaut know and when did he know it? Is it coincidental? or is it just a simple case a of Mystic Monty says? Does that statement not conflict with why the Â£250,000 was released wern't we told that they needed that money to prevent the project stalling and to continue the roll out? This statement appears to be contradicatory to the reason given for releasing Â£250,000 is it not?